OK, there's a new movie out immortalizing Marilyn Monroe. 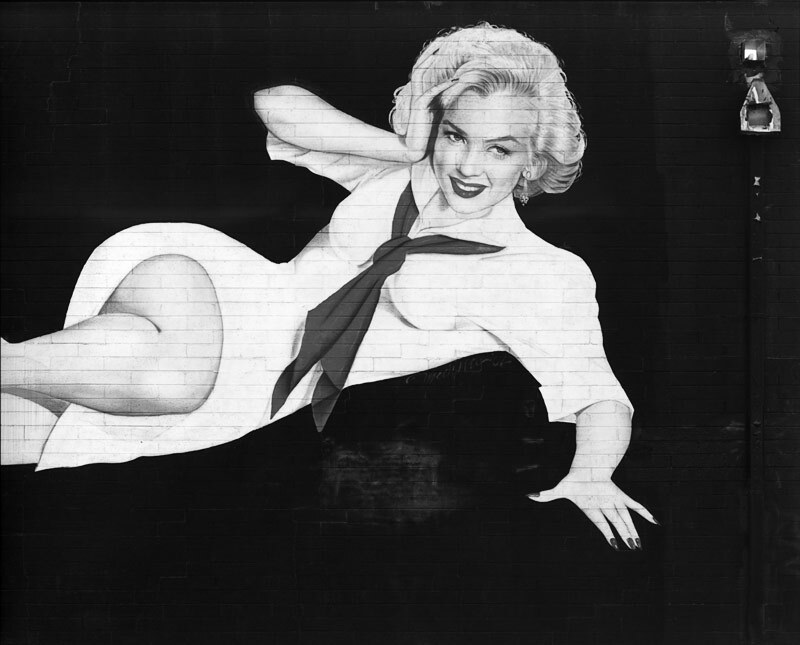 Did you know that Marilyn Monroe is immortalized right here in Phoenix, AZ? For those of you who don't get out much, there is a huge mural painted on the side of the TruckMasters building at 20th St. and Indian School Rd. in Phoenix. It was painted by Timothy Medina in 2002. The mural is more than 30 feet long and is almost super-realist in style. I photographed it early one Sunday morning in 2009 in black & white with my 8x10" camera. I deliberately chose Sunday so there would be no vehicles parked in front of it. Although I do tire quickly of Marilyn Monroe, I never tire looking at this beautiful contact print.